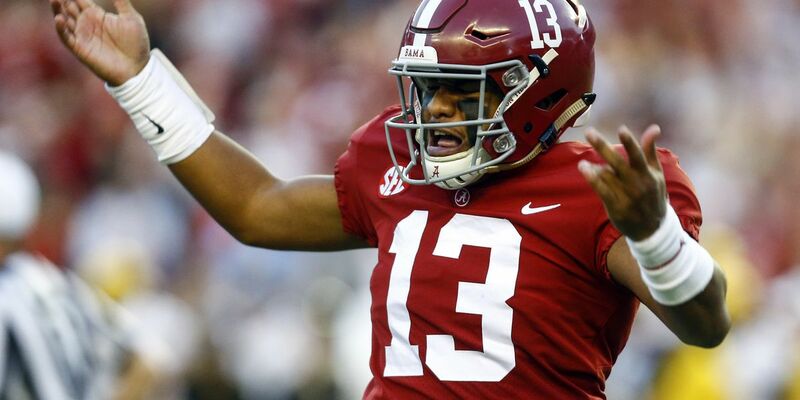 TUSCALOOSA, Ala. (AP) — Alabama got quite a scare at the sight of starting quarterback Tua Tagovailoa on the ground clutching his right knee. But the situation could have been worse — on multiple levels. The Crimson Tide got a break, Tagovailoa was able to trot off the field and apparently won't miss a practice, much less Saturday's game with Tennessee . But if the injury was more serious, top-ranked Alabama has 28-game starter and 2016 Southeastern Conference offensive player of the year Jalen Hurts in relief. "He led us to the national championship (game) two years in a row, shattered all kind of records, and his resume speaks for itself," Alabama tailback Damien Harris said of Hurts. "There's never any doubt in our minds when he has to go in and play quarterback or any other position. Jalen's a pretty special talent, a guy that you only get to play with once in a lifetime. "I'm thankful to have lined up in the backfield with him and see him do all these kind of things." Tagovailoa aggravated a sprained right knee in the third quarter against Missouri Saturday night. He didn't return but coach Nick Saban said he could have. The Heisman Trophy favorite didn't miss practice leading up to that game and Saban said Monday he is "probably better this week than he was last week." "We'll just see how he does in practice and continue to evaluate," Saban said. More questionable is wide receiver DeVonta Smith, who pulled a hamstring on a long catch and didn't return. Saban says he is "day to day." There's no doubt Alabama's offense isn't the same without Tagovailoa, who's leading the nation in passing efficiency and has thrown for 21 touchdowns without an interception. But Alabama's Plan B isn't bad either. Hurts, who also caught a pass, has played a significant number of snaps in every game and finished off the 39-10 victory . His passing rating would be third nationally but he doesn't have enough attempts. Plus, Alabama has won 26 of the 28 games Hurts has started. Hurts wound up completing 7 of 8 passes for 115 yards in Tagovailoa's absence. "It wasn't much of a big deal because we know Jalen will come in and handle business," wide receiver Jerry Jeudy said. Hurts, who is scheduled to graduate in December, opted to stick around instead of taking advantage of the NCAA's new transfer rule. It further endured him to Alabama fans, as evidenced by the reaction when Hurts caught a 7-yard pass from Tagovailoa. Harris brought up that support without prompting. "I appreciate looking and seeing how much our fan base supports him and how much they've embraced him throughout this whole entire situation," the Tide tailback said after the Missouri game." I definitely want to say thanks to our fans for the way they support him." NOTES: Saban said defensive lineman Raekwon Davis could miss some playing time. Davis was penalized for throwing several punches at Missouri offensive lineman Kevin Pendleton on the ground after a play. Davis apologized on Twitter for his actions. ... Tennessee's defense has its own injury issues. Starting outside linebacker Jonathan Kongbo tore his anterior cruciate ligament against Auburn and is out for the season. Starting safety Micah Abernathy didn't play against Auburn due to an ankle injury. Safety Trevon Flowers, a freshman reserve who has received ample playing time, also missed the Auburn game after breaking his collarbone during Tennessee's off week.